Two herbicides commonly used in Iowa — atrazine and glyphosate, the key ingredient in Roundup — have come under scrutiny for potential human health and environmental dangers and are in the midst of a contentious U.S. Environmental Protection Agency re-registration process. Pesticides play an important role in many farming operations because of their ability to protect crops from yield-crushing invasions of insects, weeds and disease. Human health concerns aren’t limited to people working in agricultural areas. Communities in Iowa have taken steps to reduce kids’ exposures by reducing or banning use of pesticides within school grounds and in parks, citing research that shows associations with childhood cancers and cognitive and behavioral issues. “Most of what we know about pesticides right now is that we see associations with disease. We don’t necessarily see all the criteria to say that it causes the disease,” said Dr. Charles Lynch, a University of Iowa College of Public Health professor and medical director and principal investigator of the State Health Registry of Iowa/Iowa Cancer Registry. Still, he said it is common for people who develop cancer or some other chronic disease to look back at exposures to things like pesticides and wonder whether there is a connection. “They start asking questions about, ‘Could it have been pesticide exposures that I had that could have caused this?’” he said. Often the science of developing new pesticides outpaces scientific studies of the health effects of those chemicals, especially when research on long-term, chronic exposures can require years to gather data. “If something has a result in two weeks, it’s clear. If it has a result in 20 years, it’s pretty hard to figure it out unless you have lots of data and lots of historical information and then it’s too late for all those poor people who had that negative effect on their lives,” said Kent Boyum, director of economic development and government relations for Maharishi Vedic City and an Iowa Organics Association board member. 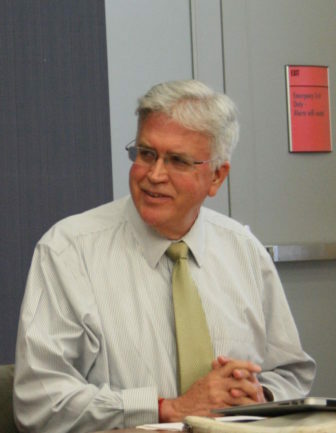 Lynch said that while studies have shown farmers and those working with pesticides have a greater risk for some health issues, he didn’t think enough evidence exists to show that Iowans not working in agriculture or handling pesticides would have much of an increased risk due to environmental exposures. “Many of the people in the general population, like you or I, would have lower exposure. But that doesn’t mean that we would be risk-free necessarily,” he said. Pesticides are divided into different categories based on what type of pest they target, including insecticides, herbicides, rodenticides, bactericides, fungicides and larvicides. The amounts of pesticides used by Iowa farmers have fluctuated over time, but in 2014 Iowa farmers applied herbicides to 95 percent of all planted corn acres, totaling more than 30 million pounds of material, according to a survey conducted by the U.S. Department of Agriculture’s National Agricultural Statistics Service. 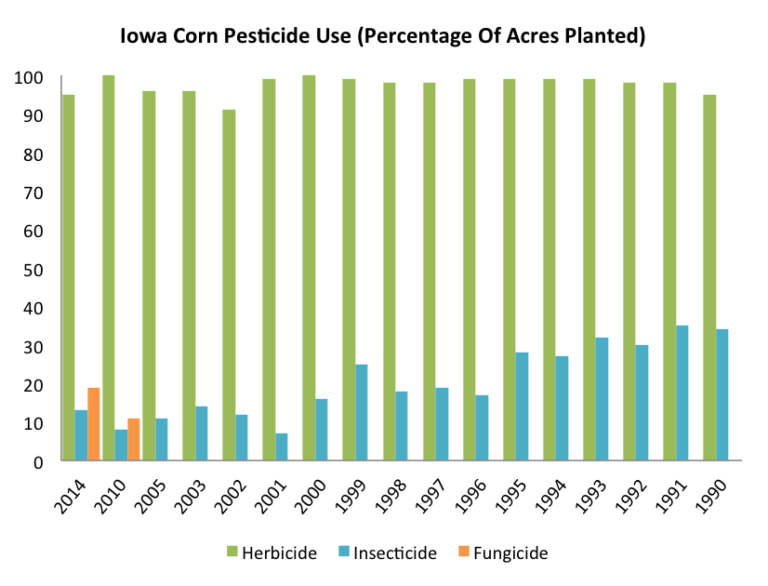 Iowa farmers applied fungicide on 19 percent of corn acres and insecticides on 13 percent. 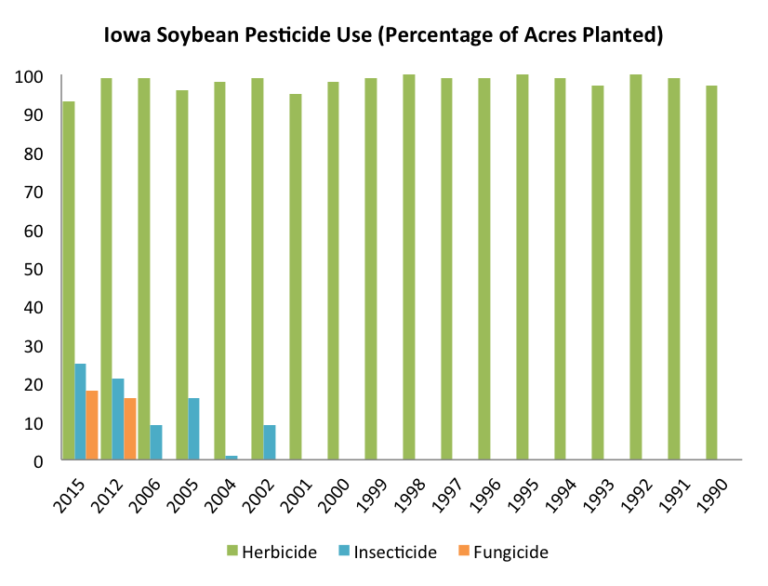 A 2015 survey of soybean acres showed 93 percent of acres planted were treated with herbicides, 25 percent with insecticides and 18 percent with fungicides. Gathering information on what pesticides farmers are using, the extent to which they are exposed to the chemical and any health issues that might develop down the road is a complex task and is the central goal of a long-term project called the Agricultural Health Study. The study, which began in 1993, follows farmers and their spouses in Iowa and North Carolina to gain information on individuals’ pesticide exposures and medical histories. The study involves investigators from the National Cancer Institute, the National Institute of Environmental Health Sciences, the Environmental Protection Agency and the National Institute for Occupational Safety and Health. The goal of the study is to better understand chronic health effects stemming from exposures to pesticides. It is an area that is still not well understood, Lynch, who has been working on the study, said. In part, that’s because the chemicals used in pesticides keep changing and many different varieties are on the market. But also, tracing a disease to any one cause, whether it is an environmental exposure or a genetic factor that increased an individual’s risk of falling ill, can be difficult. “In looking under a microscope at cancerous tissues when we are making the diagnosis, it never tells us what the exposure was, just that the disease is there,” Lynch said. Short-term effects of pesticides are better document and understood, though some may be shrugged off and ignored. Lynch said farmers have reported symptoms such as nausea and headaches after applying pesticides. Acute pesticide exposures, in which someone is exposed to a large dose of pesticides in a short amount of time, can send people to the hospital. In Iowa, 19,171 reports of pesticide exposure were reported to the Iowa Department of Public Health by the Iowa Statewide Poison Control Center from 2008 to 2012. More than 2,500 of those were occupational exposures. One fatality, the result of a crop duster crash, was reported. Nationwide, 297 people died from pesticide poisonings from 2000 to 2014, according to annual reports from the American Association of Poison Control Centers’ National Poison Data System. More than 1 million cases involving unintentional pesticide poisonings were reported during that time. Before a pesticide hits shelves, it has to be approved by the U.S. Environmental Protection Agency, which requires companies to provide data from studies that follow the agency’s testing guidelines. The EPA looks at risks to humans and wildlife as well as chances that the chemical might contaminate water through runoff, drift or leaching. This, he said, is why studies like the Agricultural Health Study are important: to supply regulatory agencies with information about how these chemicals are impacting people. This takes time. As the study gathers more and more data from people, researchers gradually get a clearer picture of any associations a chemical has with diseases. Recent documents coming from the EPA and the International Agency for Research on Cancer, part of the World Health Organization, have raised concerns among the farming community and among health professionals. Glyphosate, considered the most widely-used herbicide, was labeled as “probably carcinogenic to humans” in a March 2015 report by the International Agency for Research on Cancer. Colombia suspended use of the herbicide in its campaign to destroy illegal coca crops, used to produce cocaine, last year following the agency’s report, but then resumed glyphosate use earlier this year. At the end of June, the European Chemical Agency granted a last-minute extension to a ruling on glyphosate’s license, pushing a decision back 18-months. However multiple European countries already have bans on the chemical in place. Monsanto, the producer of glyphosate, said in a posted statement it “strongly disagrees” with the classification. “Glyphosate has a long history of safe use. In evaluations spanning four decades, the overwhelming conclusion of experts worldwide has been that glyphosate, when used according to label directions, does not present an unreasonable risk of adverse effects to humans, wildlife or the environment,” the statement on the company’s website said. The page included links to other scientific and regulatory reports that labeled glyphosate as safe. An EPA document from October 2015 accidentally released earlier this year stated that a Cancer Assessment Review Committee classified glyphosate as “not likely to be carcinogenic to humans.” The EPA pulled the document a few days after it was released and said its glyphosate review is incomplete and won’t be finished until later this year. The EPA reviews registered pesticides at least every 15 years, which includes an updated usage report, risk assessment and a public comment period. In June, the EPA released a draft report on atrazine, the second most widely used herbicide, saying the chemical poses a potentially serious risk to animals and plants. The initial 60-day comment period was extended to Oct. 4 due to concerns from the public about the difficulty of commenting during the growing season. A report on human health effects is expected later this year. Atrazine has been banned in Europe for over a decade due to its persistence in the environment. The Iowa Corn Growers Association called the atrazine ecological risk assessment “flawed” in a press release. Association representatives declined to comment further on reports of health or environmental concerns with either atrazine or glyphosate. A spokesperson also declined to comment on what impact future regulatory changes could have on Iowa farmers. Ingels farms the same area of Fayette County that his great-grandparents moved to in the late 1920s. The house he shares with his wife Tammy and their three kids is surrounded by his corn and soybean fields. On a sunny summer morning, you can hear the hogs grunting from a pin a few yards away from the porch. Ingels handles 350 acres of corn and 250 acres of soybeans as well as about 60 hogs. He said he doesn’t worry much about health impacts of pesticides and can’t imagine farming without them. However, he participates in the Agricultural Health Study, filling out surveys and occasionally submitting samples. Chad Ingels, a corn, soy and hog farmer in northeastern Iowa, pulls weeds in his no-till soybean field on Tuesday, June 14, 2016. Ingels uses herbicides as well as insecticides and fungicides, when needed, on his fields. Ingels said he takes precautions while working with pesticides, like wearing protective gear — gloves, masks or respirators and sometimes full-body suits to protect the skin from any contact with the chemicals. He also makes sure farm clothes are washed separately from the rest of the family’s laundry. He makes sure not to rush when mixing the chemicals, he said, in part because the chemicals are expensive so it’s important not to spill. That’s a change from when he was growing up handling chemicals on the farm and didn’t think much about it. In part that change has come through mandatory education sessions required in order to get and maintain a certification as a pesticide applicator. Sessions include information about safety precautions and how to read and understand instructional and hazard labels on pesticides. He said improved equipment and a better understanding of the chemicals in pesticides have led to safer use. Both commercial pesticide applicators and non-commercial applicators, those who apply pesticides to their own land, are required to undergo a written exam to become certified. Certifications can be renewed by either completing two hours of continuing education each year or by taking a test every three years. The pesticide bureau within the Iowa Department of Agriculture and Land Stewardship administers the certifications. Paluch said the continuing education sessions focus on teaching applicators how to read and understand labels on pesticides, which contain information about how to safely handle and use the pesticide. Using a pesticide in a way that does not follow the instructions on the label violated federal law. The sessions also include information about stewardship programs, being aware of dangerous terrain and information about sensitive site registries that include locations of apiaries, vineyards and organic farmland that might be in the area so that applicators can take precautions not to accidentally spray in those areas. Ingels said he uses a conventional spray program: applying herbicides at the beginning of the season to control weeds and then again later on if the weeds are bad. He doesn’t spray the fields himself in order to save time, but he used to help out as a kid and did it himself during the first 15 years that he ran his own farm. 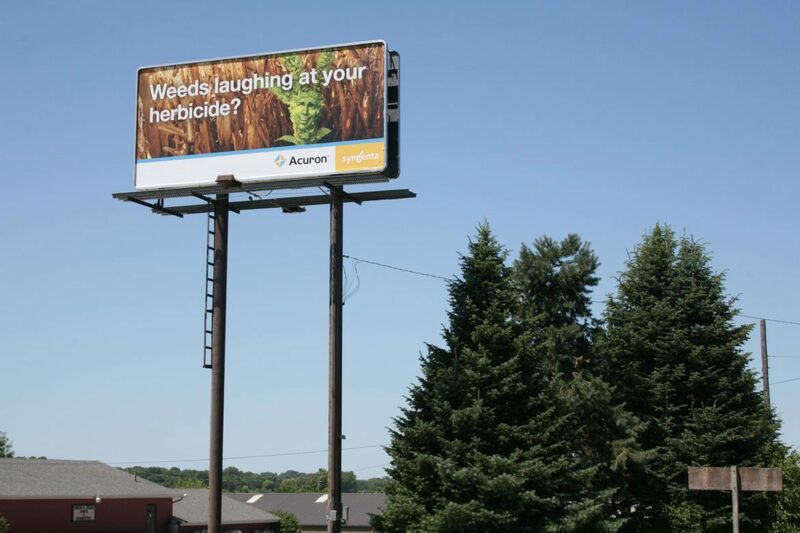 “There were a few years there where the industry kind of believed that you could just spray Roundup a couple of times and you’d be good, but we saw more weed escapes,” Ingels said, referring to weeds like waterhemp that developed resistance to glyphosate. 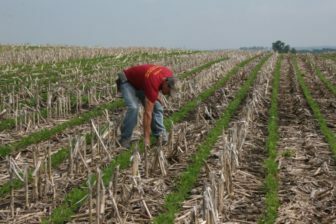 Last year he didn’t see many weeds in his cornfields and decided not to make a second herbicide pass, but what he couldn’t see was a thriving ragweed population. By harvest time, the ragweed had grown to eight or nine feet tall and was sticking up above the corn. The weeds seeded out and now he says he has even more ragweed in the field than he did last year. “We’ll have to make sure and take care of that,” he said, as he stood looking out on his field. “If we don’t control the weeds, the disease, the insects, we may have a near total loss and that’s just not sustainable for any farming operation,” he said. “Without herbicides, we would have a very difficult time growing not only corn and beans, but a wide range of vegetables across our whole country,” he said. But for others, such as Mark Quee, farm manager for the Scattergood Friends School in West Branch, and Boyum, who manages organic farmland and greenhouses through his job with Maharishi Vedic City, going organic makes sense in light of uncertainties about the health impacts of pesticides. Both Quee and Boyum spoke at a panel hosted by the Pesticide Action Network in Iowa City this past May to announce the release of a report called “Kids on the Frontline.” The report included concerns that pesticide exposure could have links to childhood cancers and developmental disorders based on the group’s review of government health trend data and recent academic research. The network is an international organization that lobbies against the use of pesticides. Quee said he used to worry about how exposures to pesticides sprayed in the fields surrounding the Scattergood farm were impacting his lungs. “Now my concern is much less about immediate impacts on how I am breathing that day, but more like: What are my grandchildren going to be facing?” Quee said after the event. “No farmer wants to harm their neighbors or their families or future generations. It may take some economic restructuring but I just have to assume the best in people and if the science shows that these chemicals can cause problems, I think that people would choose not to use them,” he added. Boyum said he chooses to eat organic and said more farmers would do so if they were able to figure out a way to financially support going organic. “The biggest thing really is ‘can I make as much money?’ or ‘can I keep my farm afloat?’” he said. The Iowa Organics Association to which Boyum belongs helps new farmers and those transitioning conventional farmland become organic. The association also promotes organic-friendly policies and organic agriculture education and research. Although pesticide exposure is highest for those working in agriculture, pesticides also are used in public parks, golf courses, schools and private lawns. “You see people in their flip-flops in their garage driveway spraying the little cracks or in their lawn when they see a weed. In general, I don’t think people think much of the dangers of pesticides,” said Kamyar Enshayan, director of the Center for Energy and Environmental Education at the University of Northern Iowa. Efforts to decrease pesticide uses in public areas have seen an uptick in Iowa. The Iowa City Community School District banned pesticide use in the fall of 2015, before approving a pest management plan earlier this year that requires district officials to use the least hazardous control methods to deal with weeds and pests. This spring, the Dubuque City Council banned pesticides at nine public parks. These efforts mirror those taken in other states across the country. In 2011, a New York law went into effect that largely bans pesticide use on playgrounds and athletic or playing fields at schools and day care centers. Pesticides are allowed to be used inside schools and centers. Connecticut has a similar ban for lawn care pesticides at K-8 schools and day care centers. Enshayan called himself a cheerleader for ending pesticide use. He has been involved in urban pesticide reduction efforts, which he said he hoped to expand to more communities as well as starting a public education campaign to make sure people know about pesticide use in areas where children and families might spend time — parks, churches, schools and hospitals. “There is an obliviousness towards pesticides and we need to get over that and then that will help us to act,” he said. Although Enshayan served an advisory role in the Iowa City school district’s efforts to reduce pesticide use, he said the push for the district to reconsider pesticide use really came from parents whose main concern was that they didn’t want their children unnecessarily exposed to chemicals. “It isn't that there aren't other environmental or other dangers out there for children, there are. But the key point is that this particular exposure is totally unnecessary, there is no reason for children to be exposed to this. So you just remove it,” he said.